Although unofficial, online mods have an active estimated monthly playerbase of over 500,000 players. Extensive modding community with thousands of mods available. See Modding. Exceeding 30 FPS introduces gameplay and physics issues. Many visual features are either missing or broken without mods. Polish copies use StarForce 5 DRM. Different port of the game, same as the mobile version. This game has seen multiple revisions since its initial v1.0 release: v1.01 ("No More Hot Coffee" patch), v2.00 ("Second Edition" re-prints), v3.0 (initial Steam version), and "NewSteam r1/2" (latest Steam revisions). The Microsoft Store version is a completely different port based on the mobile version of the game. The Second Edition re-prints of the game has hard-coded checks that prevents major modifications to the game. See Downgrading on how to make it mod-friendly. 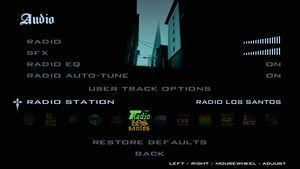 The Microsoft Store and Steam versions lack some radio songs that were present in the retail release. To restore them in Steam version, see Downgrading. Downgrading restores all removed licensed songs from the game from the latest Steam version. US executable that is provided misses French, German and Italian localizations support. Check fix below. Requires a US v1.0 executable. Adds adjustable FOV and HUD/subtitles scaling. Download Widescreen Fix and Wessler's Widescreen Hor+ Support ASI (an alternative by ThirteenAG is also available in case Wessler's ASI does not work) here. Extract the contents wshps.rar from the zip archive, go to the rel folder and then copy the models folder to <path-to-game> and the wshps.asi file to <path-to-game>\scripts. Limited new Steam version (December 9, 2014 patch) support. Rename the file extension from portablegta.dll to portablegta.asi. Place the file into <path-to-game>\scripts. Run the game, exit, then delete the contents inside <path-to-game>\userfiles. Also works with Grand Theft Auto III and Vice City. Upload & convert your save file to GTA Save 'n' Play. Very poor support by default. See Widescreen resolution. 2x-4x MSAA. Misleading in-game selector. See Broken reflections when AA is enabled for up to 16x. In-game frame limiter is mandatory to prevent a huge amount of glitches. Game normally renders stretched images. 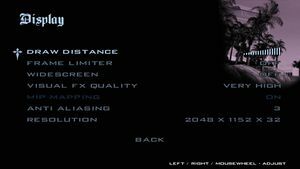 In-game widescreen option uses correct Aspect Ratio but cuts view (Vert-). 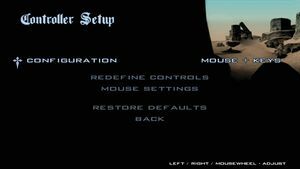 Use ThirteenAG's Widescreen Fix for proper widescreen support. Start and exit the game. Open fov.cfg to customize FOV. Zooming with sniper rifle and camera won't work properly. Install SilentPatch and enable 8x MSAA in game. Set Antialiasing compatibility to 0x00001000. Set Antialiasing - Mode to Enhance the application setting. Set Antialiasing - Transparency Supersampling to 8x Sparse Grid Supersampling. For better performance, decrease aforementioned settings to 2x or 4x. Only X-Axis by default. Use SilentPatch to tie both axes. Very basic support. SAAC or GInput are recommended. Native in Steam version. Use GInput otherwise. Can be enabled through GInput. Supports DirectInput in non-Steam version while basic XInput support was added to the Steam version. DualShock prompts require GInput. 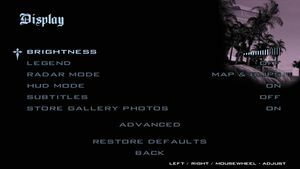 For Wii prompts use this GInput addon. Adds full XInput controller support. Restores haptic feedback from console versions. Choice between Xbox and DualShock button prompts. Features the ability to use the control layout from Grand Theft Auto IV. Place GInputSA.ini and GInputSA.asi into <path-to-game>\scripts\. Place the models folder into <path-to-game>. Open AutoHotkey, go to File>Edit script, paste the code in Notepad. Change "Fallout4" to "GTA: San Andreas" in the Notepad, save. Independent radio and effects volume. Up to 7.0 output May require DirectSound 3D restoration software. Drag the right languages.ini file to <path-to-game>\text\, according to the number of languages actually available. The German Steam version for OS X doesn't work. Rockstar is investigating this issue. An unlocked or incorrect frame limiter can cause timing related issues. Some missions such as Cleaning The Hood (after entering Crack Den building) or Cesar Vialpando (after entering to tune shop) shows black screen. If you want to disappear further, open SALodLights.ini and increase the number in "VegetationDrawDistance = 800.0" (it's in meters). Install Special K by following the Unofficial Special K Guide. Manual local installation is recommended. Go to the installation folder and rename SpecialK32.dll to dinput8.dll. DisableMoBlur = 1 - Disable motion blur when driving. DisaNitroBlur = 1 - Disable motion blur when using nitro. DisableHeat = 1 - Disable heat effect on screen. DisaRainNoise = 1 - Disable noise effect when it rains. Go to <path-to-game>\data and delete timecyc.dat. Required for many script-based mods and fixes. Magic.TXD - Easy to use program that lets you edit .txd files. IMG Factory - Powerful and feature-rich tool to edit .img files. GTAInside - Very popular and long running GTA modding site with a huge catalog of mods. GameModding - Mod site with many mods available for many games; similar to NexusMods. GTA-All - Newer website with lots of high-quality mods available. SkyGfx - Brings accurate PS2 and Xbox graphics and effects to the PC version of San Andreas. Project2DFX - Improves draw distances, asset streaming, and adds distant lights. Remastered GUI Textures - Adds the remastered GUI from the mobile versions. Enterable Hidden Interiors - Allows to enter buildings otherwise confined only in cutscenes or not used. SA_DX 2.0 - Featured ENB mod. Game graphics and lighting completly revamped. The game can work faster with GTASA.WidescreenFix.asi attached with downgrader, instead of DirectX 2.0's attached sa_widescreenfix_lite.asi. For keeping more stable 30 FPS, turn on frame limiter in game options. SALodLights.asi can fix bad vehicles textures bug. III.VC.SA.LimitAdjuster.asi can fix overall troubles with bad rendering. Downgrader binary generates slightly brighter image than Hoodlum one. Shadows flickering can be fixed by using this fix (it's d3d9.dll - attached in mod download link above) then in the game press Shift + Enter, then check in Effect "Complex Shadows" to activate it (can decrease FPS noticeably, the same for using Mix Sets). GTA Underground - An work-in-progress mod that attempts to bring the GTA III, Vice City, Bully, and Manhunt maps to San Andreas. View video updates here. GTA Vice City Stories: PC Edition - A standalone total conversion that attempts to port and remaster GTA: VCS to PC (does not require GTA: SA to play). In Mod Index you can find a bigger list of mods. ↑ 1.0 1.1 File/folder structure within this directory reflects the path(s) listed for Windows and/or Steam game data (use Wine regedit to access Windows registry paths). Games with Steam Cloud support may store data in ~/.steam/steam/userdata/<user-id>/12120/ in addition to or instead of this directory. The app ID (12120) may differ in some cases. Treat backslashes as forward slashes. See the glossary page for details. This method seems to be the only one that worked as ThirteenAG's Window Mode ASI causes constant crashes with the latest version of Widescreen Fix. This option allows the game to go faster than 30 [sic] frames per second. 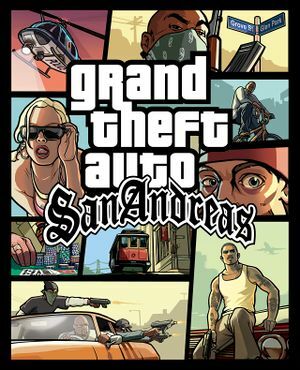 Be warned that this will not magically make GRAND THEFT AUTO: San Andreas run better, but rather may make your experience "more variable". We do not recommend un-locking the frame rate. If you have a fast machine, it is far preferable to increase resolution, detail options, anti aliasing, etc. rather than trying to achieve a higher frame rate by un-locking the Frame Limiter. This will lead to a more variable game play experience.